How does Hellboy live up to Guillermo del Toro’s beloved series? Reboots always have a hard time standing on their own two feet, and never has that been more true than with Hellboy – at least according to the reviews which are keen to drag it kicking and screaming down to the very depths of hell. 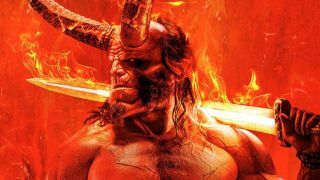 While there’s a handful of nice things to be said about the Hellboy reboot – Milla Jovovich’s performance being one of the main standouts – this is two hours that’ll have you pining for Guillermo del Toro’s threequel that never was. Not even David Harbour, who we’ll soon see in Stranger Things season 3, could turn this one up to eleven. “The race for worst movie of the year is heating up. You could even say it’s hotter than hell, now that Hellboy has taken the lead. “The sentimental father-son subplot is Hellboy at its most laughably absurd, highlighting the chasm between its script and its direction. Harbour, so endearing as Sheriff Hopper on Stranger Things, has none of the agreeable humor Ron Perlman brought to the character; as a result, his many quips go over like a fart in an elevator. “It’s two hours long but feels like an eternity, lurching incoherently from one noisy set-piece to another. Hey, maybe you'll still enjoy Hellboy. Just don't expect it to join our list of the best superhero movies anytime soon.